Part of achieving financial independence is defining what you want to spend your time doing and what your ideal future looks like. Without being too philosophical, it’s pretty hard to get “there” if you don’t know where “there” is. Logically, once you know where you’re starting from and what your destination is, the next step is drawing a route that connects the dots. Maybe your path includes climbing the ladder in your company to increase your income and responsibility. Maybe it’s starting a business to align your lifestyle with your career interests. Whatever yours is, it flows logically from where you are today to where you want to go in the future. Then, by simply executing each step in the plan, you’re sure to reach your desired destination. This is a helpful starting point. But what about all the stuff we can’t control? Even if we execute each step in our plan successfully, there’s still a chance we don’t reach our objective. Say we get sick, become disabled, or get sued. We can do everything right and still not get where we want to go. We can manage around some of the risks we can’t control by altering our lifestyle or daily habits. For example, there’s always the risk of getting injured and being unable to work. One way to manage that risk might be to avoid rock climbing, hang gliding, or fun activities that increase your likelihood of getting hurt. We can’t manage every risk, though. There’s always a chance of being hit by a bus on our way to work in the morning. And for anything we can’t manage, another course of action is needed. This is where insurance comes into play. Insurance exists as a way for us to transfer various risks to an insurance company, in exchange for a nominal premium. What would the impact be if that “thing” happened? Can we manage around it? 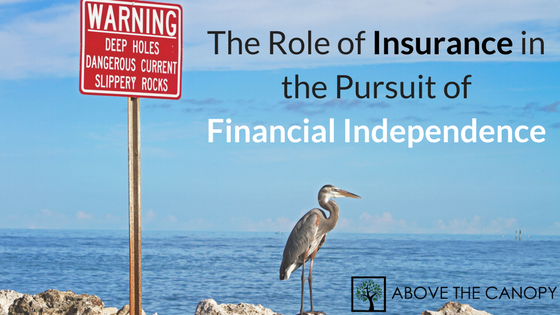 Are we comfortable bearing the risk, or should we transfer it to an insurance company? Some families will have the resources to “self-insure”, meaning that they have enough saved to where dying/becoming disabled/getting sued/etc. is not financially catastrophic. For example, Warren Buffett doesn’t need any life, disability, or long term care insurance. If he wasn’t able to work any longer he and his family would be just fine. This is probably isn’t the case while you’re on your path to financial independence, though. Eventually, your savings from what you’ve already earned will exceed what you could earn in the future. At some point afterward you’ll no longer need to insure your future earnings at all. Remember the purpose of insurance: to transfer your catastrophic risk to someone else. From a consumer’s point of view, a perfect insurance product would be transparent, easily understandable, and do nothing more than reimburse you if one of these events actually happened. Unfortunately, insurance companies are notorious for creating products meant to be sold, not bought. A transparent, plain vanilla product is easily commoditized. And in an attempt to boost profit margins, insurance companies like to package together “all-in-one” solutions that bundle various risks and even investment products. Permanent life insurance products are good examples: variable life insurance policies insure your life and allow you to invest your cash balance in mutual fund like investment options. One stop shopping at its finest. The problem with these products is that insurance companies like to charge a hefty premium. Just remember that the purpose of insurance is to transfer catastrophic risk – nothing more. In almost all circumstances your best option is to find the least expensive, most plain vanilla way to transfer risk to an insurance company. As we age and our lives grow more complex, other people often become dependent us for income, child care, or other important matters. For most people, this means that dying presents a catastrophic risk. If we weren’t around any more to put food on the table, raise the kids, or help pay for college, our family’s lifestyle might be severely impacted if we passed away. Dying isn’t something we can manage around very effectively, either. So, most families have a need to transfer the risk of premature death to an insurance company. As you know, life insurance is an extremely common product in America. It comes in many flavors though, and it’s sometimes difficult to separate what you need from what an insurance agent might be trying to sell you. In my opinion, the most effective, least expensive way to insure your life is through a level term life insurance policy. In exchange for a monthly premium, an insurance company will promise to pay your beneficiary a specified death benefit in the event that you die. No more, no less. The policy is good for a specific period of time (the term). If you still want life insurance after the term is up, you’ll need to purchase another policy at the going rate. Many insurance agents like to sell “permanent” life insurance. These products include whole life, variable life, or universal life policies. Permanent life insurance promises to pay a death benefit whenever you die – and isn’t subject to a limited term. The problem with them is that they’re very expensive when you incorporate the fees paid to the insurance company and the commissions paid to the insurance agent. Plus, you won’t need life insurance forever. Once you become financially independent your family won’t be reliant on your income any longer. There will be no reason to insure your life. I’ll cover permanent life insurance in a future post. For now, just remember that life insurance exists only to transfer your risk of death to an insurance company. Level term policies are the most cost effective way to accomplish this. What if you lose your ability to earn a living, but don’t die? 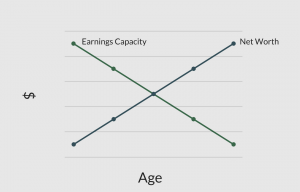 Statistically, this is far more likely that dying for anyone in their 20s, 30s, or 40s. Worker’s comp might help out if you’re injured on the job. But if the accident happened outside work, you’d be on your own. In some regards (strictly financially speaking, that is) becoming disabled is even worse than dying. Not only does your family lose your future income, but you continue racking up living expenses. And many times these expenses will be significantly higher since you may need special care. This is where disability insurance comes into play. Disability policies insure your income. If you get injured or disabled and can’t work, a disability policy kicks in and replaces your income. Disability policies are classified as either short term or long term. Short term policies usually last up to one year, at which point a long term policy would kick in. There are two predominant “definitions” of disability, as well. The less comprehensive (and less expensive) policies define disability as “any occupation”. This means that they consider you to be disabled if you’re unable to return to any occupation after an injury or accident. Alternatively, more comprehensive policies define disability as “own occupation.” These policies consider you disabled if you’re unable to return to your own occupation. Own occupation policies are extremely important for skilled or highly paid professionals. For example, consider a highly paid attorney who sustains minor brain damage in a car accident. The attorney is physically fine after the accident. But mentally he’s not quite as sharp, and is unable to continue arguing cases. An own occupation policy would consider him disabled and pay benefits. An any occupation policy would not, as they could claim he’s perfectly capable of working at a fast food restaurant. Some of the bigger purchases we make in our lives require debt financing. When we buy a house, for example, most of us borrow the majority of the funds through a home mortgage. Since we typically owe the bank a bunch of money, the potential for damages to or destruction of our property presents a catastrophic risk. Let’s say you close on a new house for $500,000. You put down $100,000 for the purchase (20%), and borrow the rest through a 30-year fixed rate mortgage. What happens if your house burns down the following week? The bank will still want its money back, and now you don’t have anywhere to live. This is a pretty obvious risk that most people insure against, and in the U.S. acquiring home insurance is integrated into the home buying process. In the grand scheme of things, you should definitely insure anything that you owe money on. And some insurance, like auto coverage, is required by the government anyway. Health insurance is a pretty big issue these days, and obviously something everyone should have. Medical care is extremely expensive. There’s uncertainty surrounding whether the Affordable Care Act will be around much longer, but even if we’re not required to have health insurance I can’t think of a good reason not to. Common afflictions like cancer and heart disease have pushed many, many people into bankruptcy. By doing so properly, nothing can happen that you haven’t planned for. Financial independence will graduate from a pipe dream to an inevitability. Posted in Financial Planning, Insurance, Retirement and tagged disability insurance, financial independence, how much insurance do I need, insuring income.